Timothy P. Deahl DDS PC (Cambridge) - Book Appointment Online! 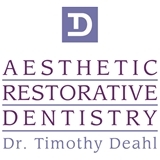 Welcome to Aesthetic Dentistry by Dr. Tim Deahl!A modern office for restorative, aesthetic and cosmetic dentistry. Timothy P Deahl DDS PC specializes in beautifying smiles, maintaining your dental health, and helping you improve your appearance. It is not secret that a great smile can make a good first impression. Psychologists believe that how we look and feel about ourselves directly influences our self esteem and confidence. Our mission is to provide exceptional dental care and patient service by using the most advanced materials and techniques available. We invite you to get to know us, what we do and more importantly how we can change your dreams of a healthy great looking smile into reality. You can trust your smile with us. Really good experience overall. While I did check-in via zocdoc the office had their own forms so I ended up having to fill those out anyway. Not a huge deal in any case. Everyone was friendly and helpful. As a new patient I first had a cleaning and then met with Dr. Deahl and had a full set of X-rays taken. The oral hygienist was friendly and efficient and informed me about exactly what she was doing and why. The doctor was very knowledgeable and provided in-depth information about the X-rays and what he is seeing and looking for with my teeth. He provided me with solid feedback and a plan of action going forward to address my concerns. I scheduled another visit for later in the year so I'll be going back!